Blessings to you, and thank you for stopping by my page. 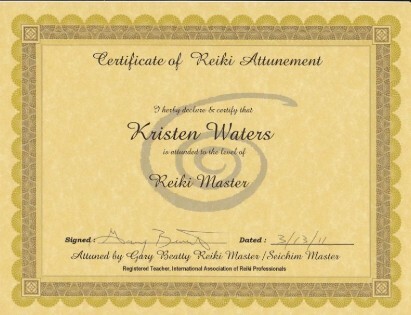 My name is Kristen Waters and I am a Certified Reiki Practitioner. 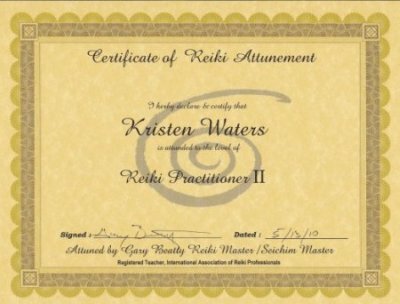 I have been attuned and certified as a Rieki I, II and Master Practitioner. You may want to know more of my own personal history. I was born and raised in the small town of Clearfield, Pennsylvania. After graduating High School, I decided to work instead of going to college. Thinking that nursing was my calling, I devoted most of my early working years as a caregiver to the elderly and mentally handicapped. In recent years, I moved to the greater Pittsburgh area and went to college and became a Medical Assistant. I then also discovered my own natural healing techniques, and I have been seeking a better way of healing. Realizing that my true calling is healing, I have been on a path of self-discovery. This personal journey has brought me to Reiki and the understanding that our Creator made us to be healthy and happy. I practice meditation, chakra energy work, and am learning many other exciting ways to better my life and the world of those around me. If you are like me and wanting to live a better, healthier and happy life, then schedule a treatment today, and feel the best you have in years! May you always know love, light and peace! A reiki practitioner is a channel for reiki to pass through and heal. A reiki practitioner has gone through an attunement process to open various energy centers in the body through which reiki passes. The practitioner is taught the various hand positions used during treatments. Essentially, reiki travels through the practitioner’s head and out through the hands. Since the reiki practitioner is only a channel for the energy, the practitioner does not use her own energy to aid in treatment. Reiki simply passes through the practitioner. Giving reiki is an intuitive process. A practitioner may be able to scan and sense where reiki is needed and will apply reiki in those areas. Reiki helps both you and the practitioner as the energy travels through both of us. I practice reiki in combination with my own spiritual beliefs, so I tend to blend in these ideas with my practice. Reiki, however, works regardless of a person’s belief system. It does not depend on my beliefs nor does it depend on your beliefs. It just works. What training does a Reiki practitioner go through? Reiki attunement is the process of opening yourself and your senses to embrace the ancient art of Reiki. This is where Reiki attunements help. Reiki attunement opens the door towards the path that connects the human body to the main source of Universal Life Energy. Every person has the power to heal his own self or another person through the use of energy. Reiki follows a system that is already present in each one of us. However, not everybody is nurturing this gift. Reiki attunement can only be performed with a Reiki master. This process can't be learned on your own, as there are many concepts to know and many techniques to practice. Reiki Masters can properly guide their students into the Reiki world using the right channels. As such, this can be a truly life-changing experience for them. Many people, as did I, fast and practice long periods of meditation. It is recommended to fast up to three days before the attunement process. Without going through Reiki attunement, it is impossible for a person to become a Reiki practitioner. In its general form, this procedure is a spiritual ceremony that introduces you to the symbols of Reiki and all of their concepts. In an attunement, energy patterns are created around the student. These patterns are each attuned to the Universal Energy of Life. In order to achieve all of these, the Reiki master has to tap into the student's subconscious and use all of the necessary symbols. The focus of Level One is on self-healing and helping others. After the student completes the required training, which may take one to four days, they are able to practice Reiki and do self-healings. At this level, the student learns the history of Reiki, the energy system, the nature of the Reiki energy, the Reiki Ethics, the five principles or precepts, the three pillars of Reiki, the hand positions, how to do a self-healing and how to provide a session for others. At Level Two, the focus is on learning the Japanese healing symbols and on sending Reiki from a distance (we must always get permission to send a distant healing). It is suggested that a student wait at least 21 days so that level one can be properly instilled and grounded within the student. 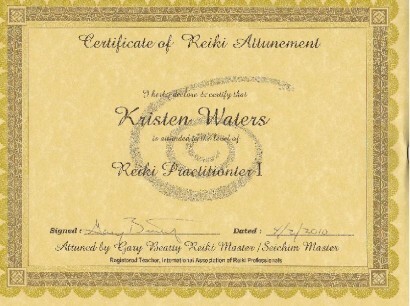 Level Three Master/Teacher: Here, the focus is on attuning others to the Reiki energy and on teaching Reiki to others. An essay is written on why the student wishes to become a Reiki Master/Teacher. It is discussed at length. The master symbol is introduced and practiced. 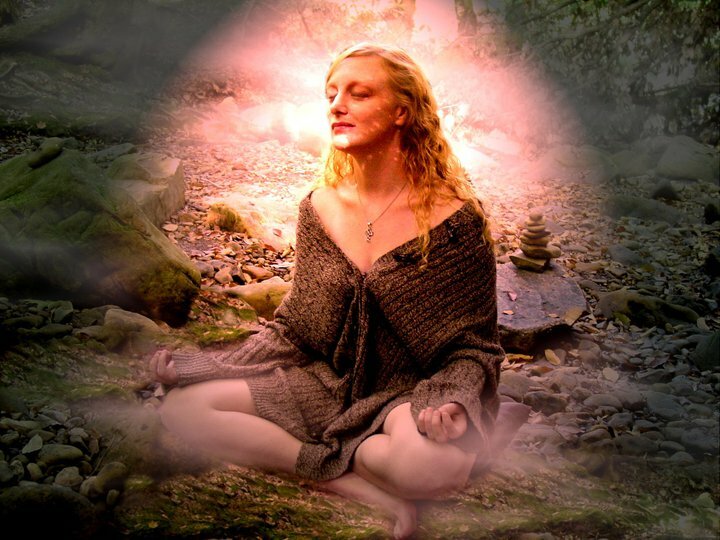 The benefits of living a spirit-based life are discussed, as well. It is recommend that Reiki I and II Practitioners wait at least one year after the first attunement.